Deputy Secretary-General Asha-Rose Migiro addresses the opening ceremony of UNCTAD XIII in Doha, Qatar. A sustained rise in prices for raw natural resources and basic agricultural goods is defying long-standing patterns and appears to be hurting poor nations through rising food and fuel costs more than it is helping them through higher revenues for their commodities exports. 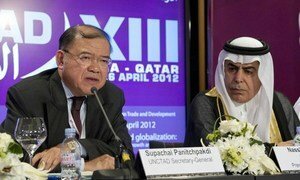 That was one of the findings of the Commodities and Development Report 2012, a study launched at the 13th session of the UN Conference on Trade and Development (UNCTAD), in Doha, Qatar, today. According to the report, mounting financial speculation in commodities and the increasing diversion of agricultural land to biofuel crops has changed the forces underpinning commodity prices, pushing them through a sustained period of increase. What should be a boon for poor nations, especially the globe’s 48 least developed countries – whose economies often depend heavily on commodity exports – is on balance a negative development because many of these countries are net importers of oil and staple foods. Since the food crisis of 2008, prices for basic nourishment have been both volatile and high, the report notes – and poor families are acutely vulnerable, as they typically spend 50 per cent or more of their incomes on food. The Deputy Secretary-General noted that UNCTAD XIII provided an opportunity to address five principal challenges: identifying measures needed to restore growth in the global economy; examining the causes of the crisis, especially those of a systemic nature, and identify measures to prevent its recurrence; identifying trade and developments policies that support efforts to mitigate climate change; making globalization more inclusive; and, lastly, unlocking the full potential of international business. Addressing UNCTAD XIII on Sunday, the President of the General Assembly, Nassir Abdulaziz Al-Nasser, said UNCTAD had, throughout its existence, closely reflected the concerns of the majority of the Assembly’s membership in the area of development – with that majority of nations also representing the vast majority of the world’s population, and with most of those hailing from developing countries. It has long maintained that the current global economic and financial system has allowed a lop-sided system to flourish, with some participants reaping the benefits while global income inequality and financial imbalances have also accumulated.